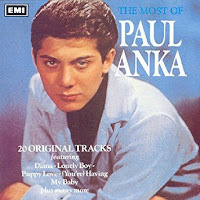 After much success in the late 50s as one of the original teen idols, Paul Anka went through a long dry period before (You're) Having My Baby topped the charts in 1974. Hits like Diana in 1959 were some of the biggest in history. But like many early 60s artists, the British Invasion killed Anka's career. He continued to record and he had success as a songwriter with She's A Lady and My Way. He left his long time label RCA in 1972 and he recorded a couple of unsuccessful albums for Buddah. Then he signed with United Artists. And I guess his key move was going down to Muscle Shoals to record with Rick Hall at the legendary hit factory FAME Studios. (You're) Having My Baby was the first single from the 1974 album Anka. It topped the Billboard Hot 100. Anka wrote the song for his wife. He was going to record it solo. But UA exec Bob Skaff suggested recording a duet. Odia Coates was a backup singer at the recording session. Anka met her while touring. She appeared on a couple of Anka's other hits. But her career didn't amount to much after two unsuccessful albums for UA. Odia died from cancer in 1991. (You're) Having My Baby has frequently been a staple of Worst Songs of All Time lists. The song is certainly sappy. But Anka was heavily criticized as sexist and chauvinist. I don't think he was thinking about that while he wrote the song. He wanted to pay tribute to his wife. As a result, I don't think he performs the song anymore. You can get Having My Baby on this CD from EMI in England which also contains some of Anka's earlier hits. Anka last recorded in 2013 but he still tours. Here's Paul Anka featuring Odia Coates performing (You're) Having My Baby on The Midnight Special 1974.